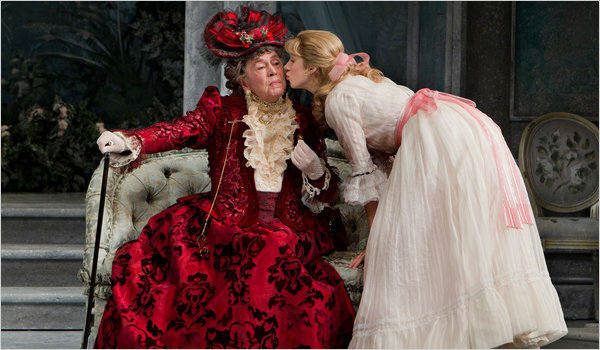 Brian Bedford as Lady Bracknell and Charlotte Parry as Cecily Cardew. Image by Sara Krulwich, The New York Times. My cousin visiting from Michigan and two of her three lovely daughters join me for a matinée performance of this Oscar Wilde romp — erudite to the extreme, lovely in appearance, predictable in outcome, with flashes of brilliance and show stopping timing in the delivery of lines. And that is just in our orchestra box. On stage: director and Lady Bracknell in drag Brian Bedford steals the show, characters move through the paces of this verbal send up of upper class British mores, and some beautiful costumes entertain us. In the same way I listen for my favorite lines in a familiar movie, I wait for the delivery of a clever Wilde bon mot and anticipate the next sweeping entrance. This is not great drama but is another kind of theatre, delivering an experience. With direction focusing on Bedford as Bracknell, often dramatically and quite literally plopped center stage. We know who we’re there to heed and which performance is being uplifted and are quite aware that the rest of the company is there to serve it. And we wait for the laugh lines. This is a well-oiled machine. A production of Wilde’s 1895 play that began on the stages of Bedford’s theatrical home turf at the Canadian Stratford Shakespeare Festival (http://www.stratfordfestival.ca/Default.aspx) and has been charming audiences on Broadway now for several months. The drama plays out between city house and country house and according to social rules and ruses that attempt to flout them, with the use of imaginary friends or characters renaming themselves. Friends Algernon Moncrieff (Santino Fontana) and John “Jack” Worthing (David Furr) find out they are more closely related than anyone suspected in the final moments — while we experience a story that dramatizes little lies that make everyday life more bearable. For the men. Algernon pretends to have a sick friend in the country to escape the city; Jack is the guardian of ward Cecily (Charlotte Parry) in the country, where she is tutored by Miss Prism (Jayne Houdyshell), who fancies the Reverend Chasuble (Brian Murray). Jack lives his city life under the assumed name of Earnest, and falls for Algernon’s cousin Gwendolen (Jessie Austrian), daughter of, ta da, Lady Bracknell. It all comes back to Lady Bracknell in this production — who lays down the law, attempts to articulate social parameters and in the process, through Wilde’s language that makes fun of her, makes fun of the weird and often arbitrary rules and reasoning that govern high society. Oh, and everyone is rich, and servants lurk around the perimeter and people wear pretty dresses. Visit to pay respect to the arch delivery of Bedford as Bracknell, if this is your cup of tea. This is not usually among my chosen theatrical adventures, so I enjoy testing my memory of this play, and the delivery of the lines. I enjoy the time with my delightful relatives who are present, and those who aren’t. Because in my family this play holds a special place. The grandfather I share with my theatre-companion cousin, so the family story goes, fell for the character name Cecily in this play. He named his second daughter, my mother, Cecily after Wilde’s creation. My cousin named her third daughter, back in Michigan taking AP exams and being a generally brilliant high school student, after my mother. So these Cecilys resonate on stage and in absentia. And we all enjoy a thoroughly respectable presentation of a piece of family origins. From our orchestra box. Mom would have loved that.